Saint Patrick's Day word work! 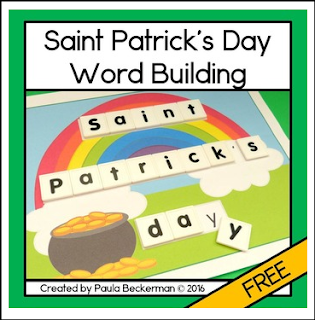 Your students will love building words for the St. Patrick's day holiday with this low prep. word building activity. Simply print, slip each page into a plastic page protector, and offer them to your students with one inch letter tiles. Students will build each word right on the page. There is even a recording sheet included for student accountability. St. Patrick's Day Sentence Picture Match. Thank you for visiting Paula's Preschool and Kindergarten. All new resources are 50% off for the first 24 hours. To be notified when new activities become available, and of upcoming sales, please click on the green star below my store name and follow me. Followers and feedback are greatly appreciated! - purchase additional licenses for others at half the regular price. To do so, go to your “My Purchases” page on TpT, locate the resource, and choose “Buy Additional License”.